U-92,016-A is a psychoactive drug and research chemical used in scientific studies. It acts as a potent, high efficacy, and selective 5-HT1A receptor full agonist with a long duration of action. It has been suggested that it could be developed as an anxiolytic or antidepressant drug. ^ a b Romero AG, Leiby JA, McCall RB, Piercey MF, Smith MW, Han F. (1993). 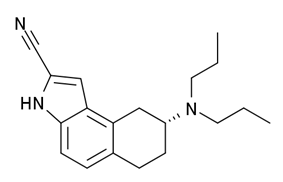 "Novel 2-substituted tetrahydro-3H-benz[e]indolamines: highly potent and selective agonists acting at the 5-HT1A receptor as possible anxiolytics and antidepressants.". J Med Chem. 36 (15): 2066–2074. ^ McCall RB, Romero AG, Bienkowski MJ, Harris DW, McGuire JC, Piercey MF, Shuck ME, Smith MW, Svensson KA, Schreur PJ, et al. (1994). "Characterization of U-92016A as a selective, orally active, high intrinsic activity 5-hydroxytryptamine1A agonist.". J Pharmacol Exp Ther. 271 (2): 875–883.